Endemic plants of Primorje-Gorski Kotar County – The Istrian bluebell – Javna ustanova "Priroda"
The Istrian bluebell (Campanula fenestrellata Feer subsp. istriaca (Feer) Dambolt) is a steno-endemic species of the Kvarner region (Photo 1). Based on recent developments in botanical systematics, it is considered to be a sub-species of Campanula fenestrellata Feer. 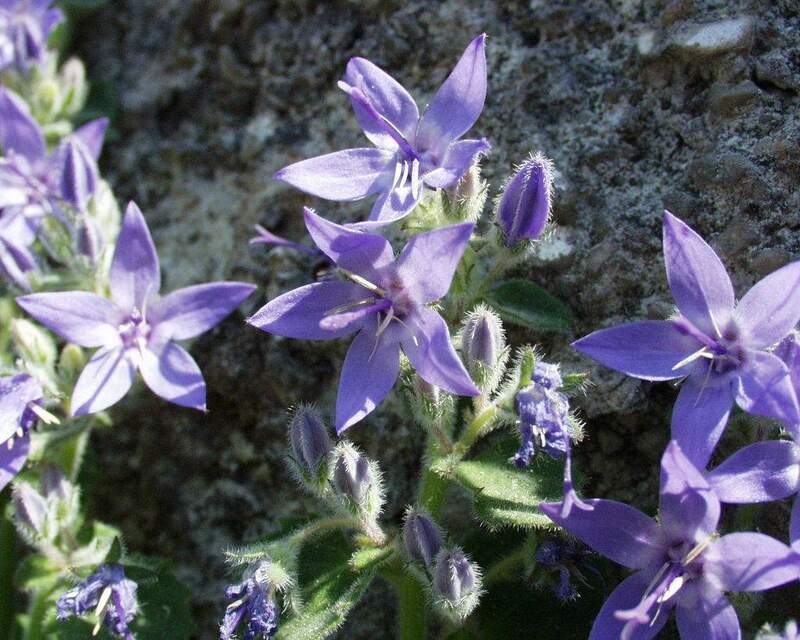 It is a perennial with a rich inflorescence of blue bell-shaped flowers, often flourishing in lush clumps that overgrow crevices in carbonate rocks. Interestingly, it also grows along the cliffs of the Kruna and Podokladi ornithological reserves on Cres Island, at Kuntrep on Krk Island and on Prvić Island, often co-existing with Griffon vultures and others birds nesting on cliffs in the Kvarner region. Rich populations of the Istrian bluebell can also be found in other rocky parts of Kvarner Bay, for example on numerous cliffs on both sides of Baška Valley, as well as on the Kvarner islands of Plavnik, Rab and Pag. The bluebell probably got its name from the fact that it was first discovered and botanically described on the walls of the ancient town of Plomin in Istria. Its natural distribution range also includes certain other parts of the Liburnian coastline: coastal cliffs at Brseč, Sisol Peak and crags at the foot of Mt Učka. The Istrian bluebell and Dalmatian knapweed community, a special endemic community found on the Kvarner cliffs, was named after the Istrian bluebell. The leaves of the Istrian bluebell are serrated, fairly soft and delicate. They are covered in felty hairs that probably help to protect the plant from excessive evaporation and from harsh solar radiation that falls directly on to the cliffs. Similar to other bluebells, the Istrian bluebell contains a milky sap and its underground parts are somewhat thick and chunky, which can be seen as an adaptation to arid conditions. As often as not, the Istrian bluebell grows on rocky coastal cliffs that are the most exposed to the bora wind. On these cliffs, the plant is also exposed to salt sediment, especially when the bora wind is blowing and strong gusts of wind carry sea spray onto the islands. The Istrian bluebell can be grown from seed (a special permit is required because the Istrian bluebell is a protected species) but a lot of effort is needed to ensure it germinates. 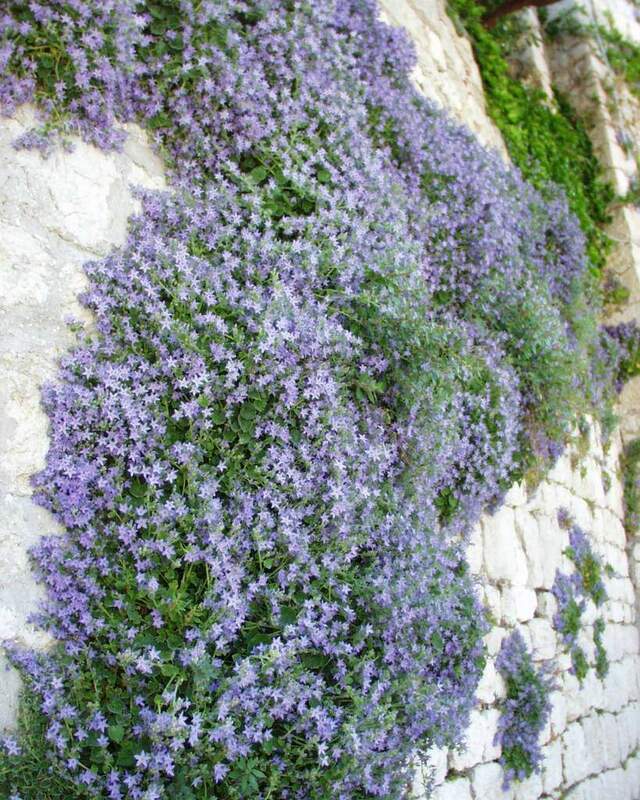 In many places, the bluebell adorns the wall ruins of some ancient Kvarner towns to where it has spread by natural means from the near-by cliffs or land (Photo 2). In its habitat on the Kvarner cliffs, the Istrian bluebell most likely developed from bluebell ancestors whose descendants still grow along the Dinaride mountain range. 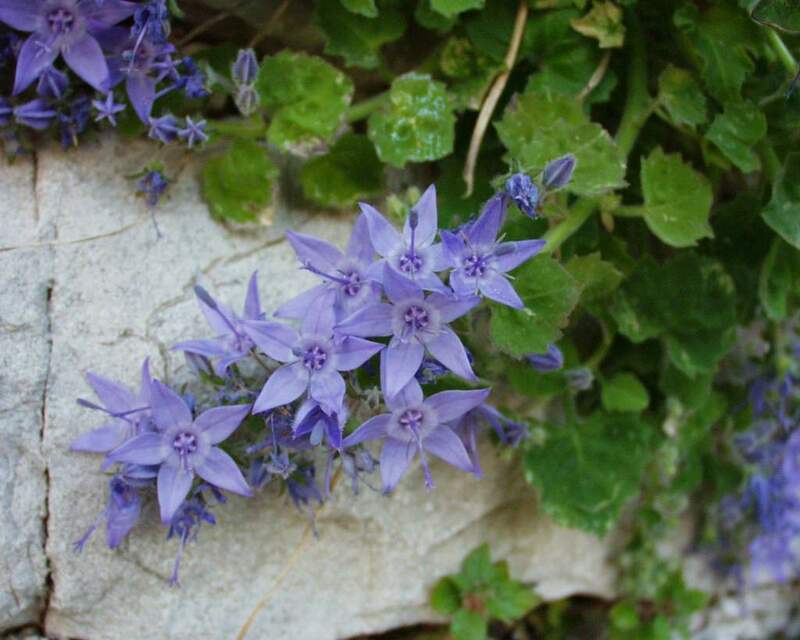 Its closest relative is the endemic bluebell Campanula fenestrellata Feer subsp. fenestrellata, which grows on rocks in the Velebit mountain range. Both subspecies are strictly protected.